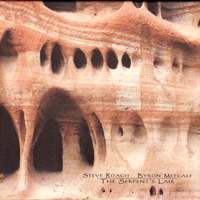 Beginning as a collaboration between Roach and Metcalf, the music on The Serpent's Lair evolved over the past year into an epic 2-CD set, augmented with a myriad of guests. For those familiar with Roach's work, this release has it all. Steve's ultra-soundworlds, hybrid grooves and magical production combined with Byron's acoustic-organic tribal trance patterns set disk 1 in motion (in all directions). Aligning with themes of shamanic initiation found throughout the world, this disc is rooted in the organic . . . the earth . . . the ancestors . . . and the initiatory energy of focused transformational ritual practice which is integrated into the alchemical fire of psycho-spiritual death and rebirth. It is here that one is confronted with all the essential elements of danger and possibility. Disk 2 -- subtitled Offerings To The Underworld" -- is built around musical elements from disc 1, yet forges a sonic alchemy as it dives deeper. Thought at times rhythmic, the overall feeling is a floating, pulsing, breathing adventure through a system of underground rivers and caves, inspiring fantastic epsiodes along the way. Guests on The Serpent's Lair include Vicki Richards, Vidna Obmana, Jeffrey Fayman, Momodou "Mohammad" Kah, Jorge Reyes, Jim Cole, Lena Stevens and Vir Unis."